2009. 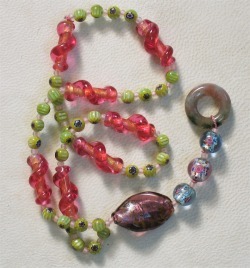 Glass, ceramic, web agate, silk. 2010. 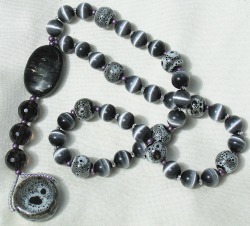 Glass, smokey quartz, onyx, silk. Many thanks to Nicanthiel Hrafnhild for helping me discover for Whom this was made. 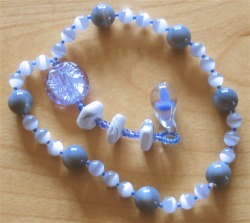 Ocean agate, chalcedony, glass, silk. 2010. 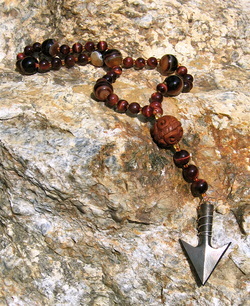 Tiger eye, banded agate, wood, iron, glass, silk. 2008. 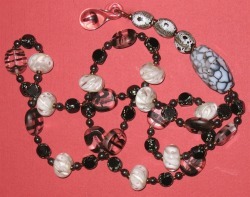 Bone, shell, glass, silk. This piece was put up for auction at ECT 2008. 2008. 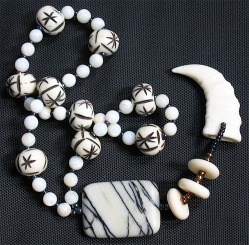 Ocean jasper, rough ocean agate, bone, ceramic, glass, silk. This piece was put up for auction at ECT 2008. 2009. 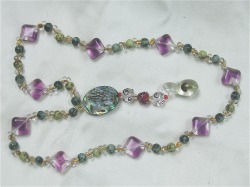 Serpentine, rough ocean agate, glass, silk. 2008. 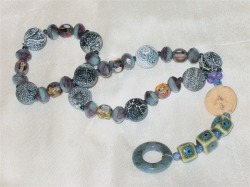 Howlite, ceramic, jasper, glass, silk. This piece was put up for auction at ECT 2008. 2008. 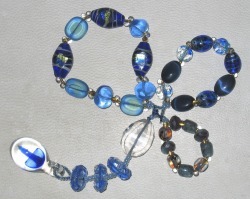 Ceramic, glass, silk. This piece was put up for auction at ECT 2008. 2008. 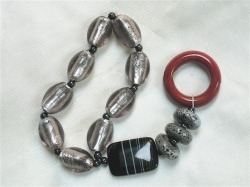 Obsidian, jasper, ceramic, glass, silk. 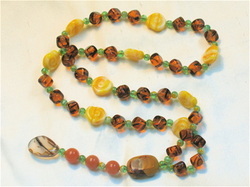 Tiger eye, ceramic, fire agate, glass, silk. 2008. 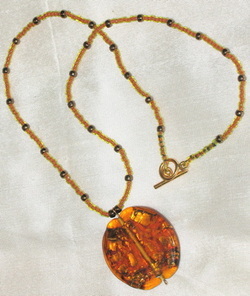 Citrine, rutilated quartz, jasper, glass, silk. 2009. 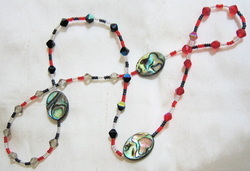 Pearl, glass, ceramic, jade, silk. 2010. 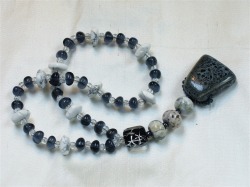 Glass, grey onyx, howlite, silk. 2008. 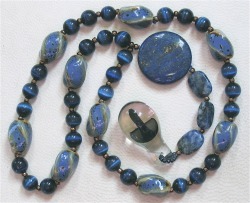 Lapis, glass, ceramic, silk. 2008. 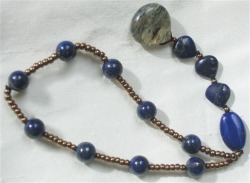 Lapis lazuli, rutilated quartz, glass, silk. 2008. 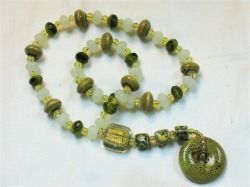 Green opal, polish conglomerate stone, glass, silk. 2009. 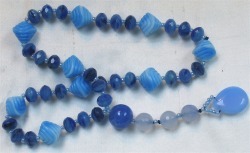 Blue chalcedony, quartz, glass, silk. 2009. 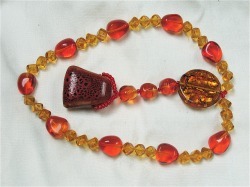 Fire opal, red tiger eye, glass, silk. 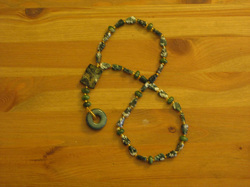 This piece was created for working with the Element of Water in the OBOD Bardic Grade. 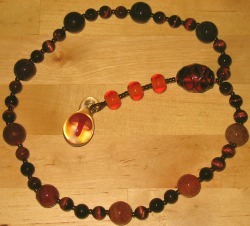 Water has always been the most difficult element for me to grasp and the rosary reflects that. 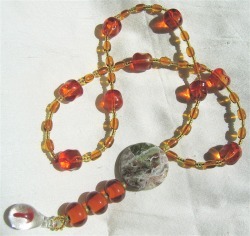 Water couldn't be a straight forward piece--instead, it ended up being three separate loops, which nest together when the rosary is laid flat. Each one is a ripple spreading outwards from the hazel nuts dropped into the Well of Segis. 2008. Bone, marble, glass, silk. 2008. 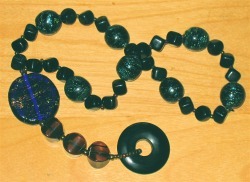 Amphibolite, onyx, ceramic, glass, silk. 2008. 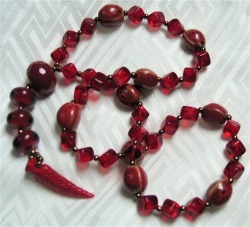 Coral, red jasper, ceramic, glass, silk. 2011. 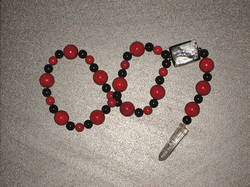 Coral, onyx, quartz, glass, silk. 2009. Commission. 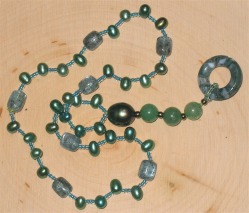 Pearl, kyanite, sea agate, aventurine, glass, silk. 2009. 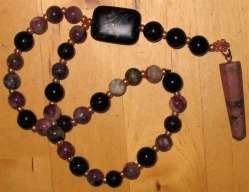 Tourmaline, black tourmaline, labradorite, marble, glass, silk. Made for family member recently diagnosed with cancer. 2010. 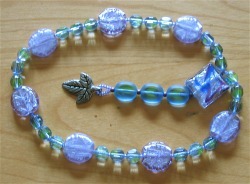 Glass, silver, silk. I made this to meditate with during labor. 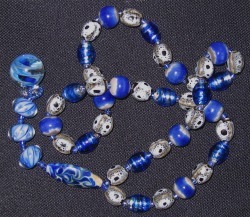 The large crackle-glass beads were quite a surprise when I got them home from the shop--in natural light, they're purple, but in artificial light, they're blue! This was perfect since I don't know the gender of the babe, so it will be appropriate whether it's a boy or girl. 2012. 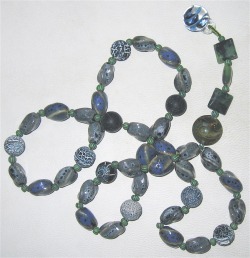 Tree agate, glass, jade, silk. 2012. 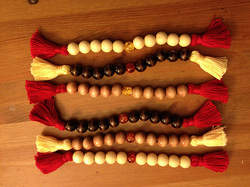 Wood, cotton, silk, resin. For their Majesties Edward and Thyra of the East. 2009. 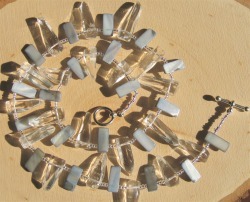 Quartz, pearl, glass, silk. 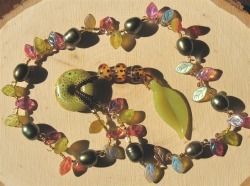 This piece was made as a donation for an auction benefiting an acquaintance whose spouse had recently passed away. 2008. 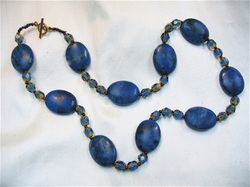 Lapis, glass, silver, silk.